WB9FLW (who had flown in from St. Louis just to help in the big push to deliver Beta), Den, KD2S, Chuck, N0ADI, John, WB7CKY and Dan, KV7B. The bottom line is that TAPR now has a shortfall of about $3000 to get the Beta project out. New boards will be ready during the week of 28 December. It is hoped that populated boards will be delivered to TAPR around 10 January, and we hope to ship by the 20th. We appreciate your patience. We want these boards to be completely reliable. Meanwhile, the software group has more time to debug and enhance the initial Beta programming. A local area network will be established with a few boards that will be nursed along to help in the software effort. While we are all disturbed by this delay, we are determined to complete development of the Beta boards and get them into the hands of the Packet Radio community as soon as possible. Maximum use of the delay will be made for software enhancement and testing, as well as initial hardware "beta testing". We think you will be very pleased with what you receive in January. Dan and Margaret Morrison (KV7B&D) reported this evening that the first of the new run of TAPR TNC boards is now operational. The board was received and assembled by Lyle WA7GXD this afternoon and early evening, and delivered to the University. 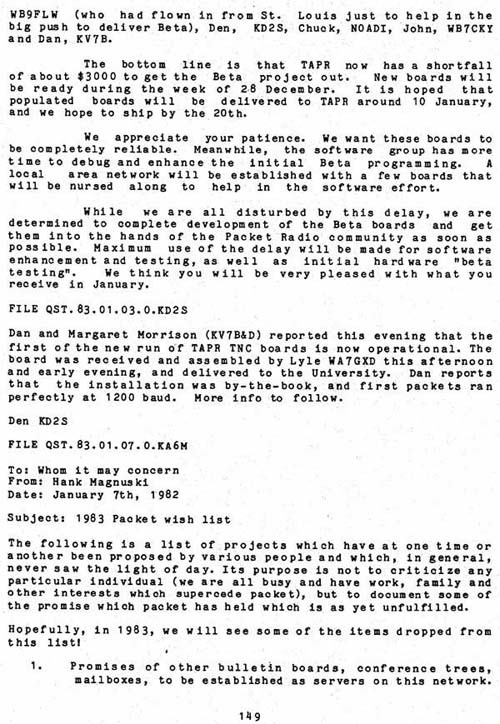 Dan reports that the installation was by-the-book, and first packets ran perfectly at 1200 baud. More info to follow. The following is a list of projects which have at one time or another been proposed by various people and which, in general, never saw the light of day. Its purpose is not to criticize any particular individual (we are all busy and have work, family and other interests which supercede packet), but to document some of the promise which packet has held which is as yet unfulfilled. Hopefully, in 1983, we will see some of the items dropped from this list! 1. Promises of other bulletin boards, conference trees, mailboxes, to be established as servers on this network..